Campaign: Death is sick and tired of the murder-hobos, the attacks on good people by evil monsters, the never-ending carnage, the constant headaches (and paperwork) of dealing with wars, so they have taken a vacation to a tropical island for some much needed rest. This has meant that nobody is staying dead, though - and has led to chaos and unrest! What will you do during the week that death isn't permanent and the impossible now appears possible? Homebase (Hex 0) (0100): Townesburg - The "Days of Life" have left the town authorities overwhelmed and the streets full of impromptu death-stunts and robbery on a scale never seen before. Power and wealth is changing hands faster than new gangs and mercenary groups can be formed, and the opportunities are growing as more small armies form with the intent of taking (or protecting) as much as they can. The wealthiest neighborhood has become a virtual fortress, with the latest protections in weapons and "other means" (arcane, divine, alien or other-planar) that money can buy. The more poor or "sketchy" neighborhoods have started to join forces to seize control of the wealth of the richer neighborhoods, and the artists/craftsmen district is looking for protection from the death-jockies who are raiding their shops for the latest avant-garde approach to dying. Location 1 (0201): Hall of the Dead - The local temple that guards the catacombs beneath have a big problem - the unliving tomb guardians are fighting with the recently interred, who've come back to live and decided that tomb-raiding was a great way to celebrate their resurrection. A forgotten portion of the catacombs was been opened during the fighting, releasing evils that had been imprisoned for centuries. The temple priests just want to keep everything underground, but with the loss of revenue from the lack of funerals, and the depletion of clerics who've fallen to the catacomb civil war, that's become almost impossible; they've started to offer great rewards for any who will come help. Location 2 (0102): Dwarven Fortress of Ptho'ie - The paladins of Ptho'ie are preparing for a holy crusade to rid the lands of the "evil" of resurrected creatures in addition to their normal job of taking care of any rogue unliving. Since the dead will not stay dead, their clerical leaders are convinced that the only solution is to send the resurrected somewhere... anywhere.. that is not of this world. This has attracted the attention and disapproval of several beings of the various other planes and off-world locations; forcing the rich dwarfs to offer a rich bounty for those who can help in their holy quest. Location 3 (0002): Dul-gurnz Tribe - Driven by their god who is demanding sacrifices that actually stay sacrificed, the orcs are on the warpath. They've taken over a university town, blaming the "book worms" for their troubles, but their sacking of the village resulted in no change and in annoyed "puny humans" who won't stay dead. The students and staff want their town back and are willing to pay heroes richly for the job, but the orcs won't stay dead either! I had some trepidation about this idea, but it has turned out to be great fun! What would players and DMs do if death wasn't permanent? What would that look like? How would that affect the order of things? How would other religions, races, species react? This might be a fun short term campaign or it could be the start of a much larger campaign where all the god(dess)s start acting up in strange ways. It's an opportunity to let your imagination run wild! I've tried to write this in a mostly neutral fashion so you could use it for just about any genre. 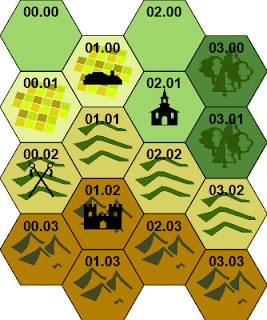 "Three Hexes" are simple campaign starters to show that you don't need to do a lot to have interesting settings for people to play in. Feel free to use these in your game, campaign or as ways to spur on your own creativity and imagination!